You can now review anything and everything via numerous other from Yelp to TripAdvisor to SiteJabber. Amazon has let you review books and products for years and even highlights the funniest ones. Realistically a business can’t please all of the people all of the time; so what do you do with bad reviews? Last week two very contrasting cases turned up. A reader posted a one star review of a book on GoodReads, and referred to it as “wordy and pretentious”. Her review was short and focused on what she did not like, she did not make any mention of the author at all. The author responded, something GoodReads specifically advises against, and asked for the reader to remove the review. And it went downhill from there, with the author posting increasingly agressive responses (capitalised words are never a good sign), and other GoodReads readers piling in, and often giving the author more one star reviews (which was not fair, unless they had read and disliked the book). The author responds to many of their comments, with wordy responses, he adds quotes from other writers, and then quotes his own book. It’s not a good look, and the author’s comments have now been deleted from GoodReads. His overall review rating has dropped, the incident has been shared all over social media, and I doubt that his tirade has drawn in any new readers. It’s a fail. At the same time an example popped up in the Dutch media. A restaurant reviewer for a local newspaper went to Bagels & Beans, which is a chain of cafes in the Netherlands selling, you guessed it, bagels and coffee. The writer gave the cafe a two star review and complained about the dry bagel, the two purposeless slices of orange on his plate, the eight “superfoods” in his yoghurt, the speed of service, the tea, the yoghurt and the decor. With all that I’m not sure why it got even two stars. We finally had someone in our cafe again, but it turned out to be a journalist. From Het Parool. He wasn’t here for fun, but because he had to write a review. And that was not positive. In fact the piece was so acidic that we recommend that you take antacids before you read it. But maybe we’re wrong, he’s obviously a professional. Maybe he does have a point. So we thought: Why not ask people who definitely understand. Whose opinion is really important to us. Who’s that? You of course! 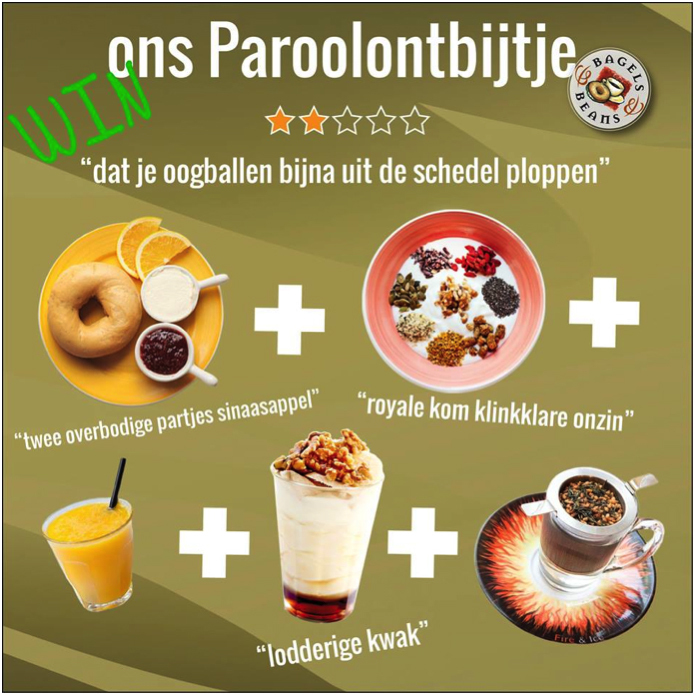 Let us know what you think of the “Parool Breakfast” and put your review here in the comments. These are the reviews we really want to have. The 5 best reviews get 1 free Parool Ontbijtje! We will announce the winners on Friday 12 June. As my colleague said “awesome way of responding to a bad review”. The responses on Facebook (in Dutch, sorry) have been positive. Apprecitative of the positive attitude of Bagels & Beans, the humour they’re showing, and their bagels. This is a win. As it happens I spent time last week training a group of social media managers and digital marketers on, among other things, responding to negative comments on social media (not specifically reviews). In general our expert advice is do not react when it’s a fair opinion; as in the book review above. But we should also consider the option of responding with humour, and directly to your fans/followers. Done well it’s a win. And for the record, the article about the Bagels & Beans reaction came from Het Parool, the same newspaper that published the bad review. Bravo to their editor, or as the Dutch would say “chapeau”.